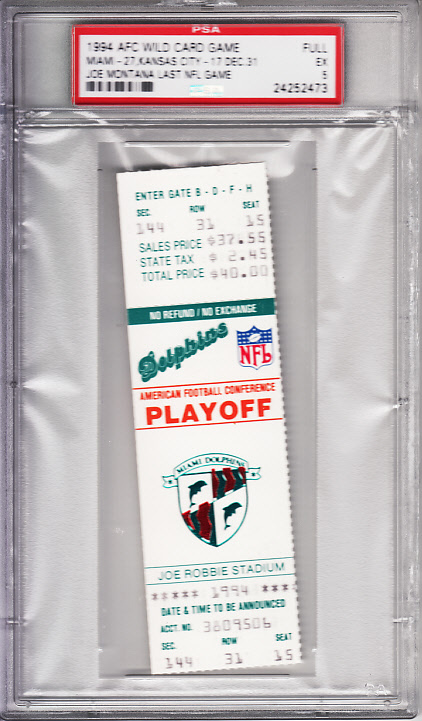 Original FULL UNUSED game ticket from the Dec. 31, 1994 Kansas City Chiefs at Miami Dolphins AFC Wild Card Playoff game in which Dan Marino and the Dolphins defeated Joe Montana and the Chiefs 27-17 and ending Montana's NFL career. Graded 5 (Ex) by PSA. 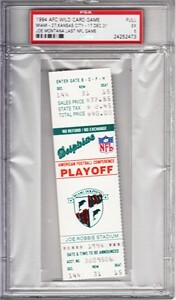 ONLY 3 AVAILABLE FOR SALE. LIMIT ONE PER CUSTOMER.